Nobody likes to see his investment portfolio going into the RED. When you first decided to invest, it was with the aim of making sizeable profits, not losses. However, the storm brewing in the US and Europe isn’t something that you really expected, and you’re at a loss as to whether you should sell, hold or perhaps, invest more. The decision is going to be tough, and staying calm in a sea of panic is going to be tougher. Despite what may seem to be an uphill task, staying level-headed is not that impossible, as long as you take the time to understand what investments are all about, and the crisis that seems to be looming in the background. Taking the time to read this article will do just that. Like it or not, volatility is the common trait of all investments. Whether you are investing in stocks, bonds or currencies, or into something exotic like wine or art, volatility is the one feature that is going to be present in all of them. Think about it: isn’t volatility – the thing that you hate the most right now – the sole contributor to your profits? That much-quoted adage, “High risk, high returns” is just a more cliché expression of the fact that volatility equals profits. Thus, before kicking yourself for making the investment decision in the first place, remember the equation: Investments = Volatility = Risk. It is a reality that you have to face when you decide to invest, and as long as you don’t liquidate your positions, volatility – at the present moment – still does not equate to losses. The slowing down of the global economy. On 5 August 2011, world-renowned credit rating agency Standard and Poor’s (S&P) took the unprecedented step of downgrading the US from its AAA rating to an AA+, something inconceivable since Uncle Sam attained this top rating in 1917. For those who are unfamiliar, the AA+ grading is just one notch lower than the AAA rating, and a rating of AA+ still places the country within the investment grade category. Other rating agencies like Moody’s and Fitch have left Uncle Sam’s sovereign credit rating untouched, though they have warned that additional deficit-reduction measures are required if the rating is to remain so in the future. So what is this big fuss about the downgrade all about? Many countries have deposited their foreign reserves with the US, making it the world’s largest bond market. One example of these countries would include China, which holds more than $1.0 trillion worth of US Treasury bonds. Being Uncle Sam’s largest foreign creditor, the land of the dragon has been very critical over how the US has been handling the debt issue, and the way they are raising their debt ceiling. Yet, the fear surrounding the downgrade is unwarranted. Many governments around the world, including Singapore, have expressed confidence in the US Treasury. Instead of being an alarm, the downgrade should serve as a wake-up call for the US government to recognise the need for them to focus on reducing their debt. This will have long term benefits for our global financial system, which does not need another shock since the global financial meltdown. Europe – with its old school charm in the likes of countries like Italy and Spain – is embroiled in a debt so deep that global markets are worried. Due to uncontrolled spending, countries like Greece are now saddled with a debt that is larger than its national economy. While things might look bleak at the moment, I do believe that not all hope is lost. The combination of the European Financial Stability Fund (EFSF) – when its use has been confirmed by parliaments – and the purchase of Spanish and Italian bonds by the European Central Bank (ECB), in the meantime, should provide stability to the markets. Europe will certainly need more time to sort out their problems but the European Union (EU) has demonstrated their commitment to resolve the hanging issues. The EU, being an economic and political union of 27 member states, will stay united as it is in their benefit to do so. The third and final attack on confidence in the markets is the slow-down experienced by the global economy. Economic data released recently indicated that the slow growth scenario is indeed playing out in some developed economies. And with China’s inflation hitting record highs, the fear is that further monetary tightening will result in a hard landing. The slow-down, together with fears of further monetary tightening in China, has raised fears that the world might be going into a recession. While such fears might seem logical, especially in the presence of cyclically weaker economic data, a full-blown recession remains very unlikely because of emerging markets. Other than that, very positive signs are also showing themselves. Since the subprime crisis of 2008, US consumers have become more prudent as they have taken to cutting down on their spending and rebuilding their savings. Many US companies are reporting strong earnings and very healthy balance sheets. The US Federal Reserve has also assured the markets that they will be maintaining the current interest rate till year 2013. The Chinese government will be watching the effects of their recent monetary policies as time is needed to scrutinise its effects. As such, the emergence of weaker economic data should be taken as an opportunity to invest in the market. In the face of the triple whammy mentioned above, speculators have decided to ride on the wave of fear by stirring further panic by short-selling to add pressure to the market. Automated sales calls made by computerised trading systems further added to the pressure. In an environment where there’s much rumour-mongering and consistent news of high borrowing costs, countries like France, Italy, Spain and Belgium have imposed bans on short-selling. Opportunities arise in a crisis, and markets always tend to over-correct themselves. In any extreme bull or bear market, there will be excessive buying and selling. The current environment is definitely one where the ‘bears’ take it to the extreme. When the tide changes, however, ‘short-sellers’ – in all likelihood – may be converted into ‘buyers’ to either stem losses or ride the rising trend. The issues, i.e. the triple whammy mentioned above, are not going to be resolved overnight. Markets will remain volatile until clarity is in sight. Yet, where clarity has returned, the market would already have risen, and any opportunity to profit from it would be long gone. As Warren Buffett would put it, “Be fearful when others are greedy and greedy when others are fearful”. Staying true to his own words, Buffett is buying into the current market. Another good reason to invest now is the very low interest rate enviroment that the US Federal Reserve has committed to keeping low. With inflation rising, the need to ensure that our capital is working harder is all the more critical. I’m not advocating that you should invest all your money now. You can’t ignore the volatility in the market either. Opportunties abound when others are fearful but you will need prudence, the right strategy and an informed adviser. One investment strategy that I really like is ‘Dollar Cost Averaging’ (DCA) which is really effective in a volatile market. Applying the DCA methodically will enable you to invest in the market without the accompanying emotions of fear and greed. And when the crisis of confidence is eventually resolved, you will be glad to know that your money has been working real hard for you. Debt is like a double-edged sword. It can help you, but it can harm you too. Making good use of debt can create wealth for you, but mishandle it and you can possibly be put into bankruptcy. What types of debt should be considered bad? Any expense-related debts can be classified as bad. Examples include taking a loan for travel and taking up a hire purchase with interest for your home furniture. This is because the value of these purchased goods usually drop after you purchase them. For example, after getting a new TV at $3,000 hire purchase, the value of it drops by $500 in the following month. Another popular form of debt comes from something almost all of us use – credit cards. If used smartly, credit cards can help us enjoy discounts and savings when we make purchases from relevant merchants. On top of that, it allows us to carry less cash in our wallets and makes payment convenient. However, if you were to delay your credit card debt repayments, the interest payment can be as high as 24%. Let’s say a person has just charged $10,000 to his/her credit card today and defaults on his/her repayments for the next 3 years. Based on the rule of 72, the total debt would have grown twice the size 3 years later. Yes, that’s a whopping $20,000! Therefore, please think twice before you use your credit cards or when taking up bad debts. You may land yourself in huge financial trouble if you fail to make repayments on time. A loan that helps you to acquire an asset which can potentially earn a higher rate of return than the loan interest rate can be classified as a good debt. Mortgage and business loans are examples of good debt. 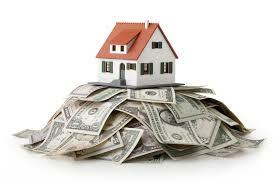 In fact, the interest rate on mortgage is the lowest among different types of loans which we can get. Although a HDB Housing Loan is at 2.6% per annum currently, you can potentially earn a higher yield if your house is timely sold in the future. At the same time, CPF Board credits a return of 2.5% per annum into our CPF Ordinary Account (CPFOA). This means that your HDB Housing Loan interest is offset to 0.1% annually. Many successful entrepreneurs have also benefited from the use of good debt. Through the use of business loans, small enterprises are able to expand their businesses. Large companies are able to grow even bigger. Another example of good debt is your education loan. The knowledge gained through your education allows you to acquire a good job and earn living. It is definitely a worthwhile investment. In summary, leveraging on good debts to grow your wealth is one of the important principles to growing rich. Here’s a warning – do not over-borrow, as you may get yourself into trouble. How do we ensure then, that we do not over-borrow? Your monthly debt repayments should not add up to more than 35% of your monthly salary. If your monthly salary is $4,000, then your monthly debt commitment should not exceed $1,400. 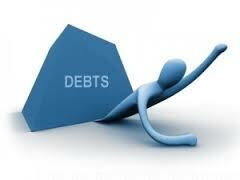 Avoid bad debts and use good debts smartly – this is a sure way to create great wealth for yourself. Most people do not want investing to take up too much of their time and effort. This is due to us having many other things in life to focus on, such as our careers, families, housing etc. And so, trading, timing the market and stock picking is not suitable for 90% of retail investors. So how can you grow your money without taking up too much time and effort? Here are 4 simple ways to do so and if you stick to this, there will be a high chance for you to retire comfortably after 20 to 30 years. Inexperienced investors looking to grow their money without active monitoring can first look to compound interest to pursue gains over time. The key ingredients here are starting early, and staying invested. By doing so, you will have more time to grow your money. The table below shows how even saving and investing a small amount every month when you are young benefits you, simply because of the power of compound interest. Market timing and stock picking are not suitable strategies when you want to invest passively. What you can do is to construct a well-diversified portfolio. 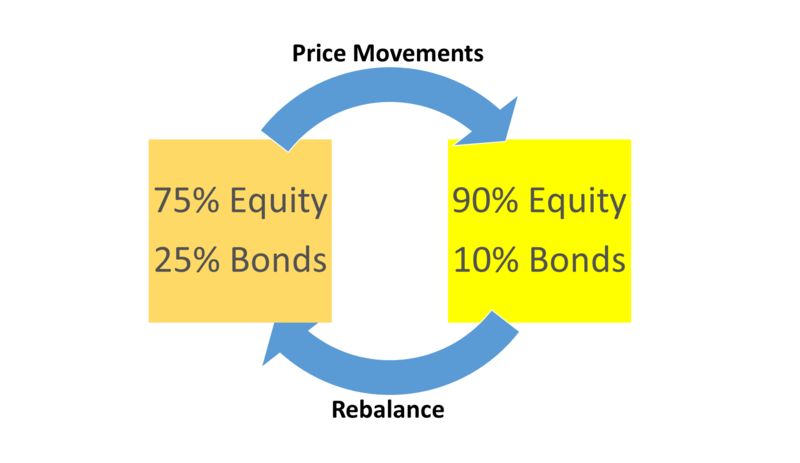 Diversification involves another important concept – Asset Allocation. This means mixing you portfolio among various asset classes to spread your risk. The most common asset classes for retail investors are: equities, bonds and cash. A lack of diversity means less liquidity in times of need. A simple two-asset portfolio, comprising bonds and equities, helps to enhance returns and reduce risk. The proportion of a person’s investment portfolio to be allocated in bonds should be equal to the person’s age (or age minus 10 if he/she is more risk tolerant). The reason behind this formula is because as we age, we are closer to retirement and should safeguard out nest egg by having less exposure to risky assets such as equities. For young people who mostly have higher risk tolerance, they can allocate more of their investments in equities which can potentially yield higher returns. I have written a separate article on why we should invest in equities if we have a long investment horizon to prepare for retirement. Besides the classes of assets, having a basket of stocks spread across different geographical regions can reduce your long-term portfolio risk. Interestingly, we should note that much research have shown that more than 90% of investment returns are determined by asset allocation. Only 10% is influenced by stock picking and market timing. 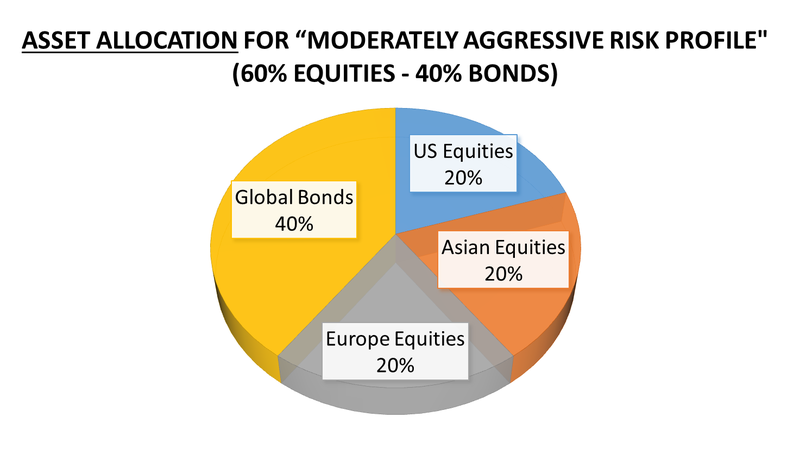 The pie chart below illustrates the recommended asset allocation for a person with a moderately aggressive risk profile. Every stock investor may fall into the trap of emotional or irrational investing. This stems from our 2 strongest emotional forces – fear and greed, which leads to failure to grow our money. 1. Fear – When the price of our stock holdings fall, a common response stemming from fear is to sell our shares and cut our losses. 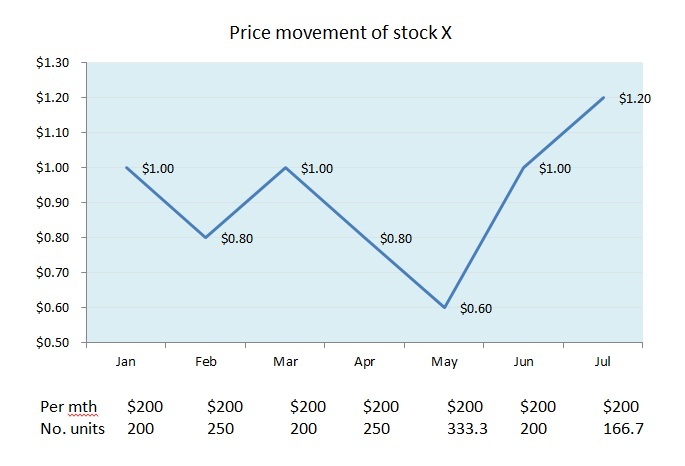 Subsequently, when the stock price rises, we may be afraid to invest in the stock again. If the stock price continues to rise, we may enter the market too late to see any substantial return. 2. Greed – When we see the price of a stock going up, greed drives us to invest our money in it, with irrational optimism that the price will continue to rise. Quite often, the stock price drops instead. This enables us to take advantage of Dollar Cost Averaging, a passive mechanism which helps you to buy less of an investment when the price rises, and more when the price falls. This lowers your overall purchase price for investments in the long term. Given the dynamic global economy, investors should review their investment portfolio regularly and change the mix of assets, a process called rebalancing. Rebalancing safeguards your portfolio from being exposed to undesirable risks and maintains your original desired asset allocation. This would ensure you are on track to meeting your financial goals. Compound interest is paid on the initial principal and also any interest that is accumulated for previous periods of a deposit or loan. When Albert Einstein discovered the rule of 72 which applies to compound interest, he was instantly awed at the wonder of it. He believed that anybody can make use of compound interest to grow their wealth. So, what is the rule of 72? If you have $20,000 and this amount of money reaps you an investment return of 3%, you will required 24 years for it to grow to $40,000, twice the size of your initial investment. So, if you can achieve a higher rate of return of say 7%, you will only require 10 years for the same $20,000 to double. Therefore, if you wish to achieve financial freedom and retire as early as possible, it is crucial to understand how compound interest works to help you grow your money. By keeping your money invested, your returns compound. The longer you stay invested, the greater the compound effect. Just like managing a football team, managing your wealth properly requires a good team of players in 3 departments – defence, midfield and forwards. In a game of football, let’s imagine if we have a team with a great goalkeeper and defenders but without strong forwards, will we be able to win? Well, the best possible result may perhaps be just a draw. In reality, when it comes to managing wealth, many people have made the mistake of being too conservative. A dangerous thought which they have is keeping all of their savings in their bank accounts, assuming it is the most reliable way to make their money grow. However, they have forgotten the fact that bank interest rates can never keep up with the pace of inflation. Over a long period, the savings of these people will diminish in terms of purchasing power. On another hand, can a football team do without a dependable goalkeeper and defence? The answer is certainly no. 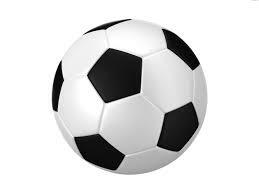 When facing the fierce attacks of an opponent, a team with a weak defence will be in shambles and suffer terribly. Similarly, without proper insurance cover to protect our wealth, if any disaster strikes, a rich man can very quickly become a poor man. Therefore, just like managing a football team, managing your wealth properly requires a good team of players in 3 departments – defence, midfield and forwards. With this analogy, let’s look at these 3 departments in wealth management. As the saying “Saving for a rainy day” goes, we should aim to keep an emergency fund of 3 to 6 times of our monthly expenses. This sum of cash will come in handy when events like a salary cut or retrenchment happens. For this emergency fund, we can save our money in bank savings accounts, fixed deposits or money market funds. At the same time, we should also purchase insurance. For instance, hospitalisation insurance covers your medical bills in case of an accident or critical illness. Surgical fees can amount to over tens of thousands of dollars, and treatment for long-term illnesses such as kidney dialysis can cost more than $20,000 annually. With adequate protection, it gives you a peace of mind that unforeseen circumstances are prepared for. To understand your insurance needs, you can refer to an earlier post here. A strong midfielder has to be able to support the forwards and help out in defence. You can think of putting your money in investment instruments with moderate risks, such as savings endowment policies and balanced funds which invests in a mix of fixed-income (bonds) and equity, some with a larger portion in bonds. Alternatively, you can set aside a pre-determined amount to invest every month in global funds. This strategy of dollar cost averaging can help your money grow in the mid-term. With a solid defence and reliable midfield, if you have a surplus of cash and wish to grow it, you can put your money in investments with high returns and high risks. Such investments include real estate, stocks, currencies or sector funds. For those of you who actively keeps an eye on the stock market, you should have a super-sub forward – an opportunity fund. Every crisis comes with an opportunity. Whenever there is a global stock market recession, we are presented with an opportunity to buy stocks at very low prices, like it were the Great Singapore Sale. If you had bought DBS shares in early 2009 when the price was $7 per share, you can sell them off at $16 per share now and earn a huge profit. Here’s to your financial success by managing your money just like a football team, or for the matter, any other team sports which requires a defence, midfield and forwards.